Warm golden colour. The faintest echo of greeny gold. Very, very thin band of gold floating on top of liquid. Sound: Slaps and tinkles in the glass. Bubbles quickly disperse when poured. Nose: Honey. Honey. Honey! Green gorse bushes. Doughy, bees wax. Plums and melons. Green tomatoes. A salty lick and a hint of floral perfume. Sticky toffee pudding sauce and nougat. Then limes, ice cream and a sharp warm citrus hint of oranges. Dusty sunshine. An alcohol zizz into the nostrils… this must be the feeling like taking snuff? A hint of bananas, then toffee again. An infusing warmth, and some kind of pink flower. The flowers are the ones you found in your grandmothers front room, and some of them had sharply fragrant leaves if you crushed them between thumb and fingers…. Soap! and sandwiches – specifically brown bread triangles spread with soft Craft cheese…. Soft dusty sun kissed wooden lofts in a farmyard. Creme brulee. Boiled sweets and again – honey. Faint American cream soda – and the fizzing of pixie dust that we got as children and sprinkled on our tongues. Bananas and honey again and now deeper into the dram… here is the strength of youth – barley, fish and mince!! – ice cream – the sweet sour heart, giving power to the dram. Nosing again from the top – burnt gorse, toasted sesame seeds sprinkled on a loaf. Mouthfeel: So silky. A rolling, chewy sweetness. Buzzing at the tip of the tongue and front gums. A warm atmosphere in the chest. Not a long length. The dram is only young. Nosing after Tasting: Stronger now, the dram is roiling a bit. I can sense the strength in the energy of it. Icing sugar on syrup sponge. Then, pine needles on the ground banked up between the roots of a tree mixed with other leaves, the forest loam. Over view: A sensate dram. A sun kissed honey. It vanishes quickly. There is a fuzzy diffuse warmth in the chest. This is a sensate adolescent of a dram. You enjoy their company when they are with you. Then they are gone. This dram evokes a feeling of summer. You remember the feeling. This dram has a line of power contained within the body that leavens the honey sweetness. It is balanced between strength and sweetness. It leaves a lovely aura about one. 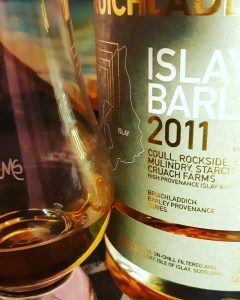 A lip smackin, honey rollin gorgeousness of a dram! I could easily drink much more of this….